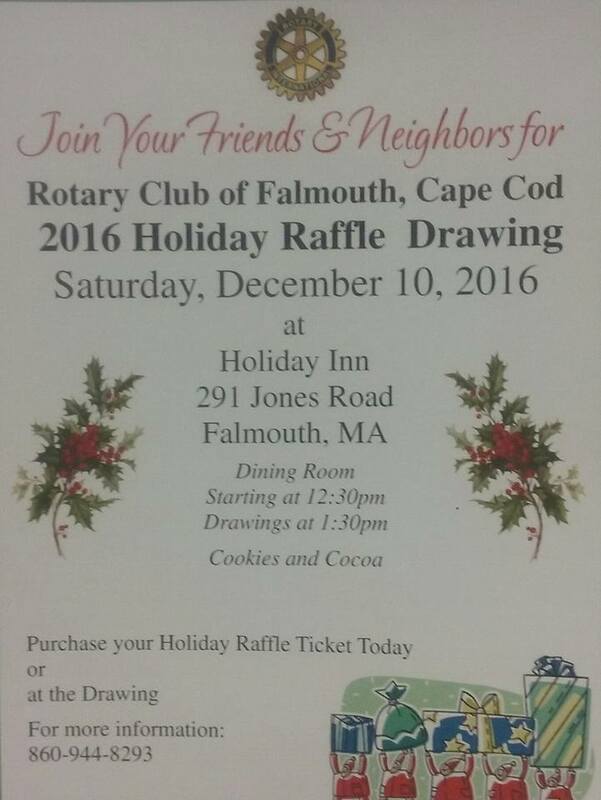 At a public drawing sponsored by the Rotary Club of Falmouth held on December 8. 2018 at the Flying Bridge winners of the drawing were randomly selected and announced. Club President Robert Mascali hosted the public drawing and announced the following members of the community as winners of the following cash prizes. $500 Winner - Susan Shephard, $100 Winners - John Silvia III, George Kurker, Nell Fields, Bill Dougherty, $50 Winners - Rob Blomberg, Gary Pelletier, George Pelletier, Shamus Dever. Robert Hansen and Alison Wells. 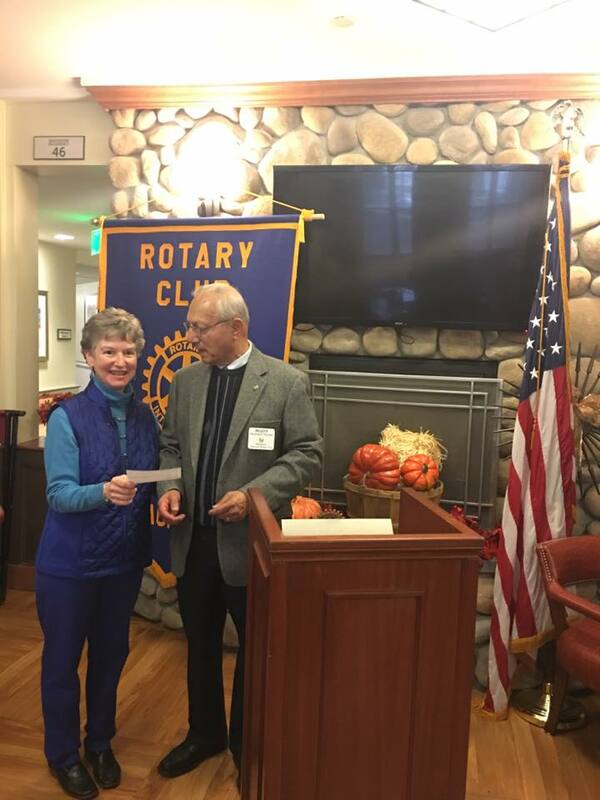 In a public outreach, members of the Rotary Club of Falmouth contacted residents and local individuals to purchase $10 raffle tickets and/or donate to support college students for local students, provide fresh food for families in the military at the Joint Base Cape Cod, and address homelessness in the local area. As part of an ongoing effort by the Rotary Club of Falmouth to strengthen the community, fulfill The Rotary Motto of " Service Above Self", and raise funds for local scholarships, military family support and those individuals in need on the Upper Cape the 2018 Holiday Raffle has been developed and will be implemented. Purchase Ticket here. 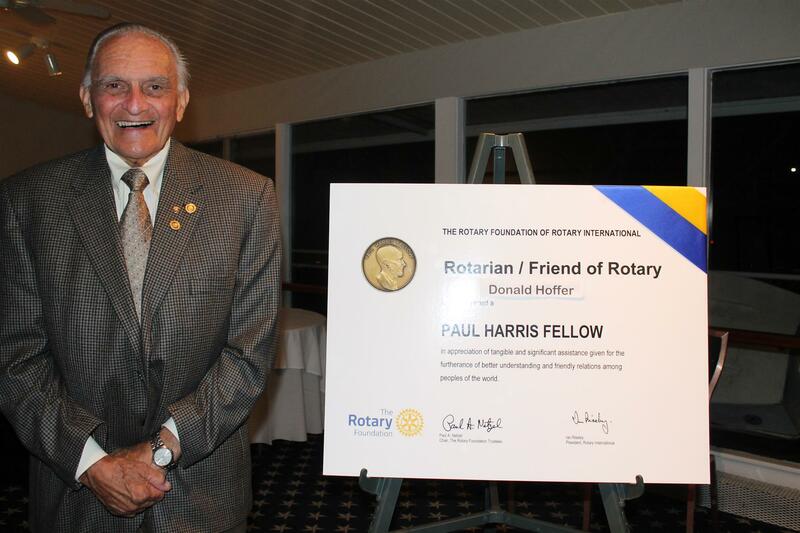 The Rotary Club of Falmouth held its annual Paul Harris Recognition and Awards Dinner on October 23 at The Flying Bridge and recognized Falmouth Police Chief Ed Dunne and longtime Rotarian and community activist, Don Hoffer as Paul Harris fellows. The Rotary Club of Falmouth Cape Cod hosts its 18th Annual Antique & Craft Fair Labor Day Weekend! 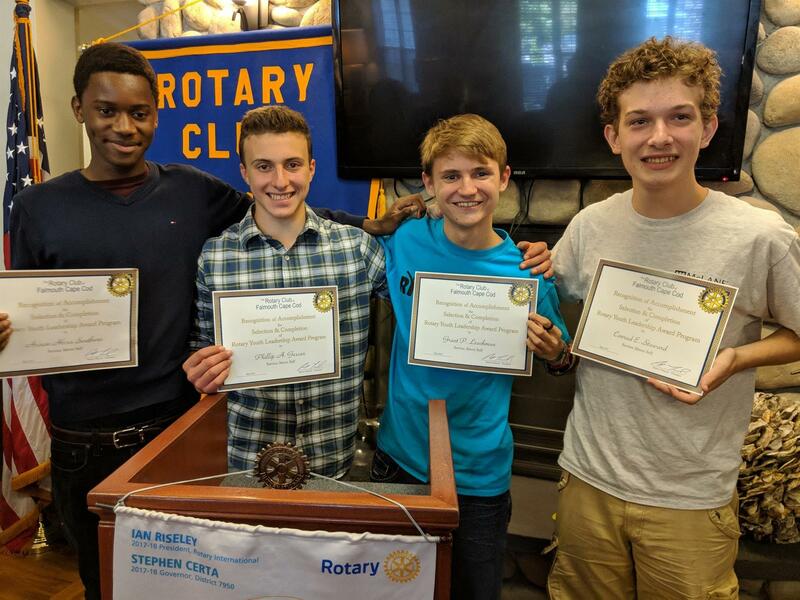 Congratulations to these outstanding young gentlemen for receiving Rotary Youth Leadership Awards and participating in Rotary International's leadership training weekend! The Rotary Club of Falmouth will be hosting an Earth Day "Plant-A-Tree" ceremony at Spohr Gardens as part of Rotary International's environmental sustainability initiative. The event, which is free and open to the public, will take place at Spohr Gardens during Daffodil Days on Saturday, April 21st at 12 Noon. The Rotary Club of Falmouth is proud to announce that on September 14, 2017 an Interact Club was certified by Rotary International for Falmouth and surrounding area students. The Interact Club is designed for students between the ages of 12 to 18 years old with a mission to provide leadership training, build positive character traits, enhance relationships between students from different cultural and racial backgrounds, and foster positive health habits. The formation of the Interact Club is a coordinated effort between The Rotary Club of Falmouth and the Falmouth Public Schools. The advisors for the Interact Club at Falmouth High School are Head of the Guidance Department Mr. Alan Kazarian, and Guidance Director Susanah Brooks who are working with the Chair of the Rotary Club of Falmouth's Interact Club Mrs. Bethany Dever and an Interact Committee. The first informational Interact meeting for the students was held on September 13, 2017 and attracted 31 students. Over the course of the next few weeks the student members will vote for officers, write and implement by-laws and a constitution for the club. The students will also develop and implement a community project for the fall of 2017. To learn more about being a member of the Interact Club contact Mr. Alan Kazarian or Susanah Brooks at Tel: 508 - 540 - 2200 Extension 4047 or Bethany Dever at bethany.dever@yahoo.com or Allan Wilson at aswilson1999@gmail.com. At the Falmouth High School Scholarship and Awards Evening held on June 1, 2017 at Falmouth High School Kathyran Hamilton was awarded the first ever woman athletic scholarship for $1,000 from the Rotary Club of Falmouth. Kathryn was a two sport captain in field hockey and woman's lacrosse achieving all league recognition in both sports. She is also a top student and plans to attend Virginia Tech in the fall or 2017. 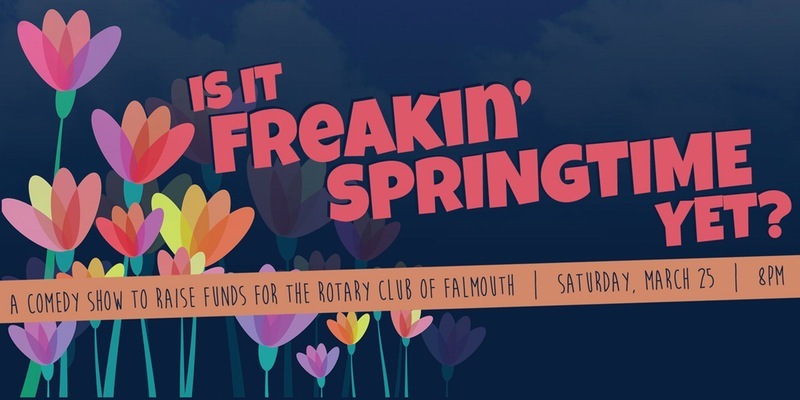 The Rotary Club of Falmouth wishes to thank the standing room only crowd of over 130 individuals who attended the " Is it Freaking Spring Time Yet Comedy Show on March 25, 2017 at the Holiday Inn in Falmouth. There were lots of laughs for charity lead by comedians Adrienne Bauman, Anthony Scibelli and Joe Yannetty who kept everyone involved and enjoying the evening. A Special Thank you to the Holiday Inn for their generous donation of space and operational support and to Flapjack Productions for making all the arrangements for the production of the comedy show. The evening also raised $1,000 for the Rotary Club of Falmouth scholarship fund and to help support military families on the Joint base on Cape Cod. Thank you for helping the Rotary Club of Falmouth support the local and international communities. 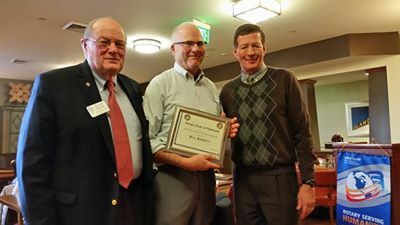 Will Barrett is recognized by President Allan Wilson and Past President Steve Clay for his outstanding contribution to the Falmouth Rotary Club as a Past President and as Chair of the Philanthropy Committee. Welcome to new member Bethany Dever,who was inducted to the Rotary Club of Falmouth Cape Cod. Bethany is a Financial Advisor for Martha's Vineyard Savings Bank. Congratulations to all the winners of the 2016 Holiday Raffle! And thank you to all who participated and purchased chances. You help our club give back to our community by supporting us! Foghorn for 11/29 and 12/6 - It's a Twofer! We would love for you to join us next weekend for cookies & cocoa while we draw our annual raffle winners! There is still time to purchase your ticket and help us meet our yearly goal so we can help fund our annual good works and scholarship funds. Brenda Swain, Executive Director of the Falmouth Service Center accepts financial award from the Falmouth Rotary Club. You will be registered for all 21 drawings. No more than 425 tickets sold. 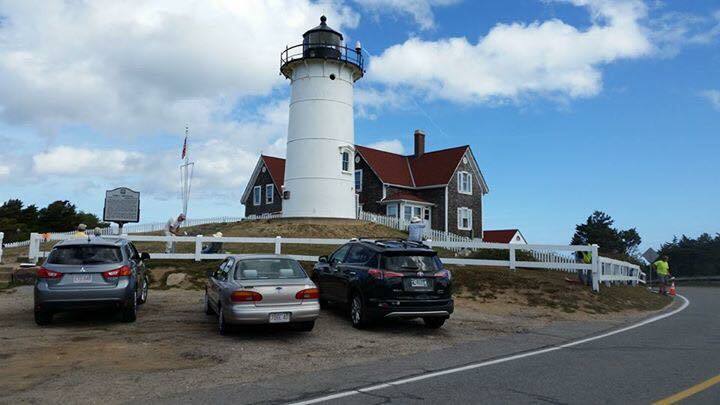 The Rotary Club of Falmouth Cape Cod came out in force this past weekend to help paint the fence surrounding the iconic Nobska Lighthouse! Thank you to everyone who came out and helped, it was a great time and we thank you for your service! 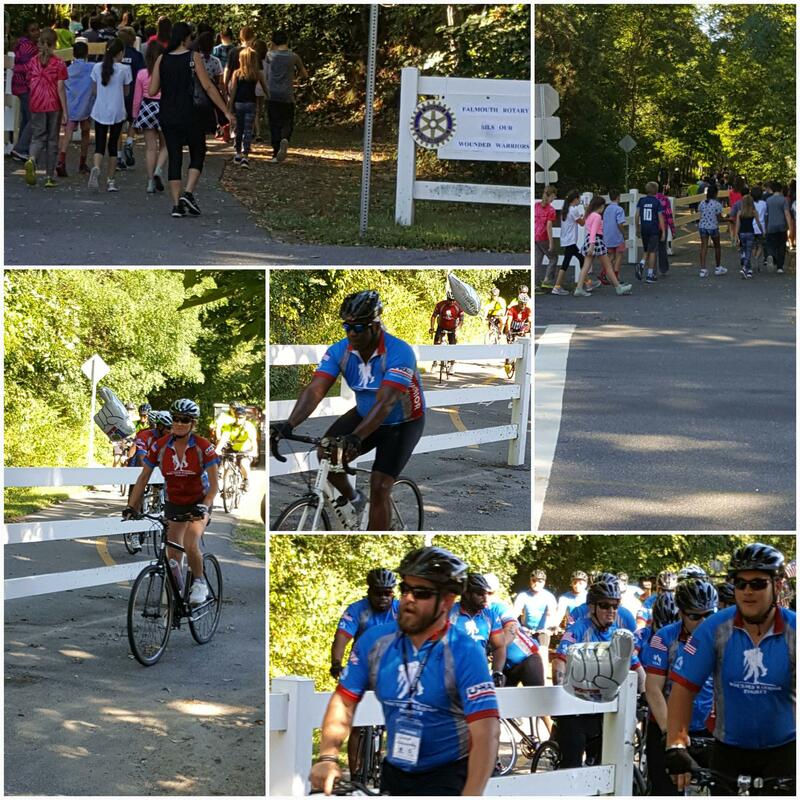 Rotarians from the Falmouth, Cape Cod Club showed up in support of our veterans taking part in the Cape Cod Wounded Warrior Ride along the gorgeous Shining Seas bikeway. Check out our photo album for more pictures. 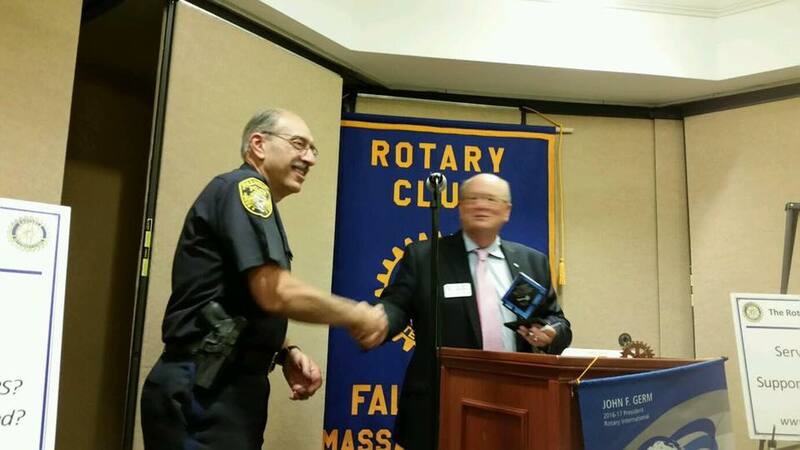 President Allan introduced Chief Edward Dunne and presented him with a Recognition from the Rotary Club of Falmouth to the Falmouth Police Department for its protection of the citizens of Falmouth. Chief Dunne thanked the Club and said it meant a lot to be recognized. The Department wants to give back to the community. Chief Dunne has been in the Police Department for 38 years and now is the Chief. He recommended to us the Citizens’ Police Academy, which will run for ten weeks on Thursdays from 6:30 to 9:30 and begins on 9/17. There will be ride alongs and you will wear a bulletproof vest. The Department is authorized for 58 Officers and hired 11 last year, which means the department trends young and eager. All those considered had a connection to Falmouth. Currently 2 are attending the Police Academy in Randolph. The Department assigns an officer as liaisons to each neighborhood of which there are 33. Officers stop at all Falmouth Schools and there will be School liaisons this year. There was an important discussion about drug use and Narcan in response to a question from the group. Falmouth has an Opiod Coalition which combats the presence of opiods. The Department has done a good job of cleaning up pill factories in town and taking out the top dealers. The merits of Narcan were frankly discussed by Chief Dunne and on average one person a day is brought back from death by drugs by the administration of Narcan which every officer has done. It is important to recognize that drugs are an addiction not a choice which affects those in all walks of life. 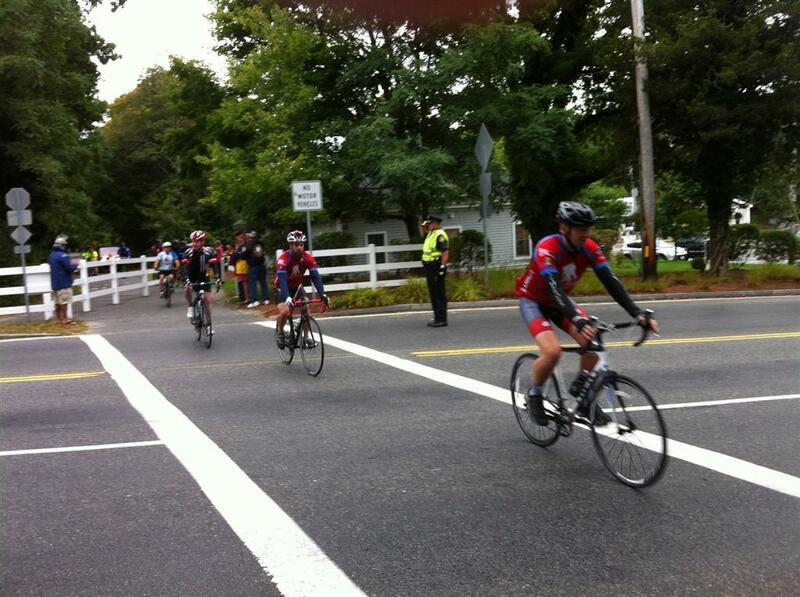 Falmouth is fortunate to have the presence of recovery facilities in town. 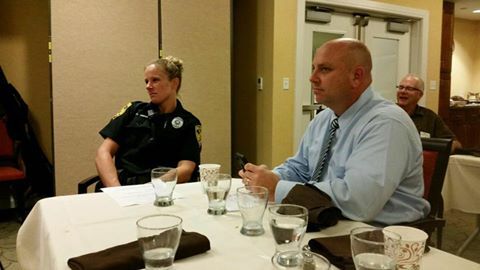 Sam P spoke of how the Police Department has empathy for all those residents of Falmouth that it serves. 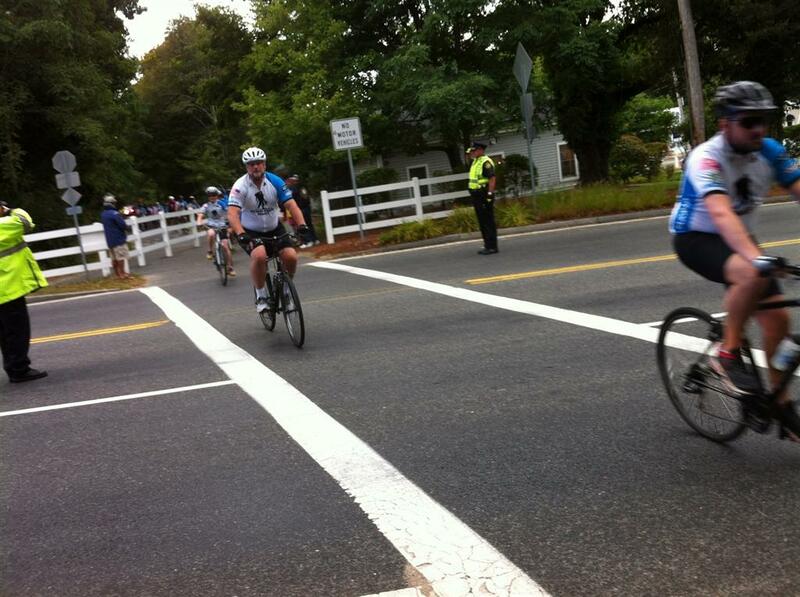 Thanks to Chief Dunne for his sharing the story of the Falmouth PD with us. We are fortunate to be so well served. Welcome to our newest Rotary Club of Falmouth Cape Cod member, Sam Patterson! Congratulations on being inducted today! Rotary Club of Falmouth Fall & Winter Meeting Schedule will start with a luncheon meetings on September the 6th, 20,27 starting at 12:15pm and with a Dinner Meeting on the 13th of September starting at 6:15pm. For October thru December 23,2016 there will be luncheons meetings on every Tuesday in the month except on the second Tuesday of every month there will be a dinner meeting. The Holiday Celebration will take place at the December 13th dinner meeting. Meetings are open to past, present and visiting Rotarians and their guests. Congratulations to Emily Gedney on being honored with the Rotary Club of Falmouth's Youth Recognition Program Award this morning! We are so excited to welcome Adrienne Baumann, Director of Marketing for the Cape Cod Children's Museum, as our new Falmouth Rotarian. She was inducted today and has already been an active member with us. Congratulations Adrienne! Congratulations to Lily Peterson from Falmouth High School for receiving our Rotary Club of Falmouth Youth Recognition Award. An amazing young woman who is giving back at school and the community. She also travels to Boston Children's Hospital weekly to volunteer there. We are pleased to recognize you and your service above self. Thank you for presenting to us District Governor Russell Bertrand and Karen Bertrand. Inspiring words to help us celebrate the 100th anniversary of Rotary International. We appreciate hearing about our mission and projects and we are excited to be on this journey with you. 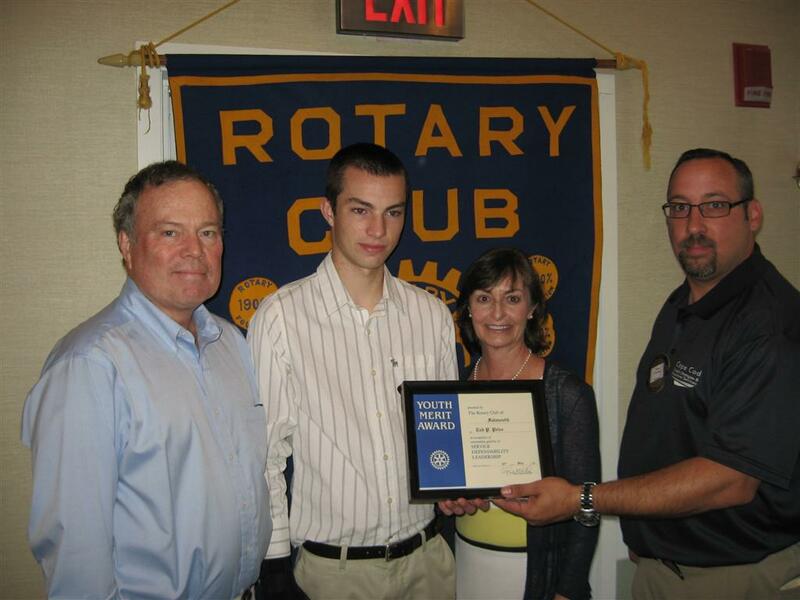 Congratulations to Andrew Pariseault for being awarded the Youth Recognition Program Award from our Falmouth Rotary Club. He is a Falmouth High School rising student who goes above and beyond with service in our community. Well done. The Scholarship Committee of the Rotary Club of Falmouth is pleased to announce that the recipient of the 2016 Junior Year Scholarship is Ms. Callie Donahue of East Falmouth. Callie is a Biotechnology major at Rochester Institute of Technology. Such a great showing with 18 Rotarians helping with body markings for the Falmouth Triathlon at Surf Drive Beach this early morning. We marked athletes from age 12 to 79. Thank you all. Great fun too! 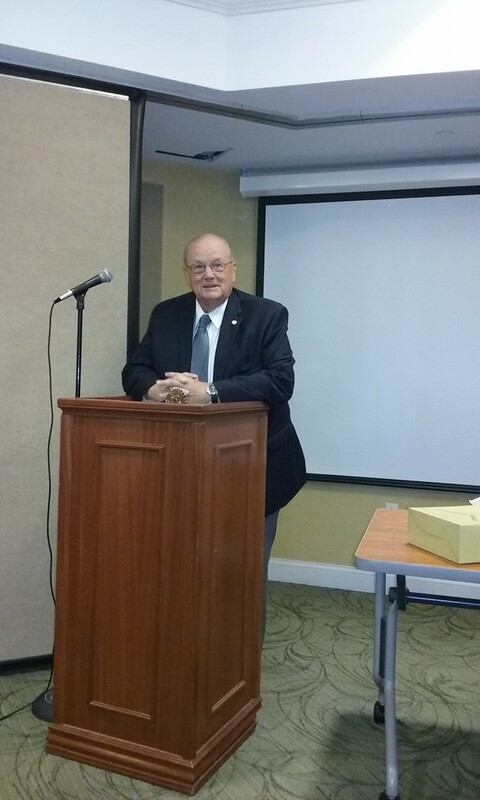 New President Allan Wilson is inducted and shares his thoughts for our upcoming new year! Our local club motto for this year will be "Building from Strength". Congratulations to Allan! We look forward to a fruitful and strong year with you at our helm. The 2016 College Scholarship Application is now available under the download section of our website! Applications are due by June 1, 2016. The Falmouth Rotary will hold its 15th Craft & Antiques Fair featuring the popular Old Time Fiddle Contest the weekend of Saturday, September 5 and Sunday, September 6, 2015, at Bigelow Marine Park on Scranton Avenue in Falmouth. Hours for the fair are 8 AM to 4 PM. "The Rotary's annual crafts fair is a family event," Rotary president Robert Osol said. The fair attracts more than 2,500 people to more than 60 vendor booths. Vendors offer antique furnishings, handmade and estate jewelry, as well as china, glassware, and crafts. This year's event will once again feature a judged old-time fiddle contest with more than a dozen fiddlers competing. The expanded entertainment schedule will also include musician Frank O'Rourke and dance demonstrations by Falmouth Dance Academy. Proceeds from the crafts fair help Rotary fund its scholarships for Falmouth students including the competitive College Junior Year Scholarship, grants awarded to local non –profits, efforts to support clean waters, and Rotary's worldwide effort to eradicate polio. Congratulations to our 2 Students of the week who attend Falmouth Academy! Bourne resident Kunaal Rajagopal came to Falmouth Academy in the 8th grade and will be a senior in 2015-16. A member of the National Honor Society, Kunaal has also been elected by the students and faculty to serve as Treasurer of the Student Council in the coming year. Kunaal has consistently been a Head of School’s List student. To be named to the Head’s List, a student must earn no C’s and at least three A’s. Like the second student honored today, Eliza Van Voorhis, Kunaal is an outstanding athlete as well as an excellent student. He has played 4 years of varsity basketball and was named to the All-League Team in the Cape and Islands League this past year. He plays AAU basketball and coached this summer at the Falmouth Academy basketball camp. He hopes to play basketball in college. Kunaal is also a varsity lacrosse player and has been elected captain of both basketball and lacrosse for next year. Kunaal is a role model to the younger students at Falmouth Academy, with whom he enjoys spending time. Next year, he will teach a once-a-week elective, Recreational Games. Eliza Van Voorhis, who commutes to Falmouth Academy from Mattapoisett, will be a junior. Two of her older siblings graduated from the school, and her older sister Charlotte will be a senior. Eliza was elected Secretary of the Student Council, again by vote of the entire community, and she is also a member of the National Honor Society. Eliza has been named to the Head of School’s list consistently as well. With two years to go at the school, Eliza has already played 3 years of varsity soccer, 3 years of varsity lacrosse, and 2 years of varsity basketball. While she excels in all three sports, and has been named all-league in both basketball and soccer, she truly excels in soccer and hopes to play in college. She was named the MVP of the Cape and Islands League in soccer this year. In fact, Falmouth Academy athletes won the league MVP award in all three girls’ sports this past year. Eliza’s talents are not limited to the classroom and the athletic fields. She has won several awards for her work in photography and ceramics. 2015 College Junior Scholarship Winner! The Scholarship Committee of the Rotary Club of Falmouth, MA is pleased to announce that Ms. Amy Wilson of East Falmouth has been chosen to receive the 2015 scholarship for entering juniors. Ms. Wilson is a nursing student at Simmons College. A 2013 graduate of Falmouth High School she will receive a BSN in 2017. Falmouth Rotary Club Will #Shelter4Nepal This Weekend! Even though the daily news coverage has slowed, over 500,000 victims of the earthquake in Nepal remain homeless and the monsoon season is just around the corner. As a result, the Falmouth Rotary Club is launching a major effort to raise awareness of the continued housing needs and to raise funds to help provide ShelterBoxes for ten families. The local Rotary Club will have a ShelterBox set up at Peg Noonan Park from 10:00 am on Saturday, June 27, through 5:00 pm on Sunday, June 28. 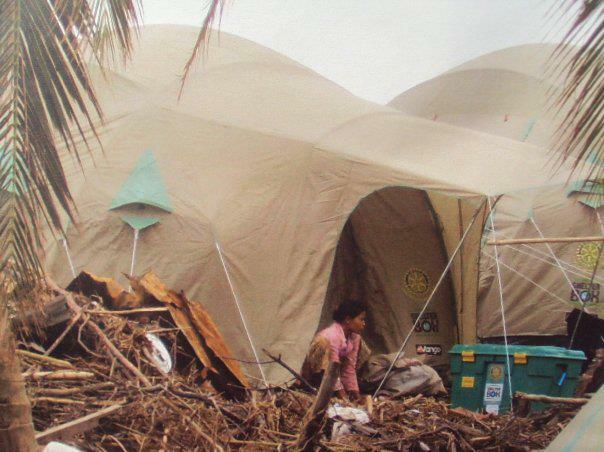 Residents and guests are invited to examine the tent and its contents, and to make a donation. The club raised over $10,000 four years ago with a similar project following the Haitian earthquake. ShelterBoxes contain a tent that will sleep 10 people as well as the necessary supplies that families need to return to some form or normal routine and to help restore their dignity. Since its founding in 2000, the non-profit volunteer organization has collaborated with Rotary International to respond to earthquakes, floods, volcanoes, tsunamis, hurricanes, landslides, typhoons and conflict, delivering emergency humanitarian aid to communities in need. The 2004 Indian Ocean tsunami, the 2010 Haiti earthquake, the Syria crisis, and the biggest storm to ever make landfall – Typhoon Haiyan in the Philippines; ShelterBox has responded to some of the largest humanitarian crises the modern world has ever known. Alongside this, they have also helped many thousands of people displaced by disasters that are not featured in the media. The display will be manned around the clock during the weekend. 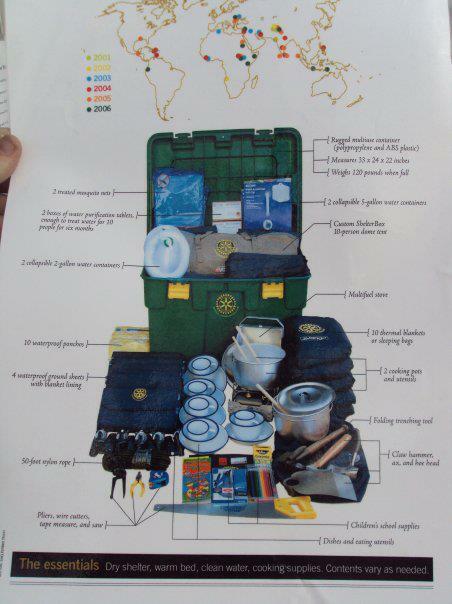 For complete information, visit www.shelterboxusa.org, www.falmouthrotary.com, or call Will Barrett (831-262-6989) or Steve Clay (508-563-5800). THE 311 STUDENTS OF THE 6TH GRADE HAVE ISSUED A CHALLENGE TO THE FALMOUTH AND CAPE COD COMMUNITY TO JOIN WITH THEM IN RAISING FUNDS TO INSTALL NEW WELLS AND IMPROVED SANITATION FACILITIES AT A 1300 STUDENT PRIMARY SCHOOL. THE STUDENTS WILL WALK 6 KL CARRYING 6 LITERS OF WATER IN A BACKPACK ON APRIL 17th, 2015 AT THE MORSE POND SCHOOL. THEIR STUDIES THIS SCHOOL YEAR HAVE CENTERED ON THE SERIOUS LACK OF CLEAN WATER IN THIRD WORLD COUNTRIES AND THE IMPORTANCE OF WATER CONSERVATION. MORE INFO AND BACKGROUND ON THE SCHOOL BELOW! 2 cases of oranges was donated for the students participating by Stop&Shop in Teaticket. All the water will be collected at the end of the event and donated to the Falmouth Service Center! 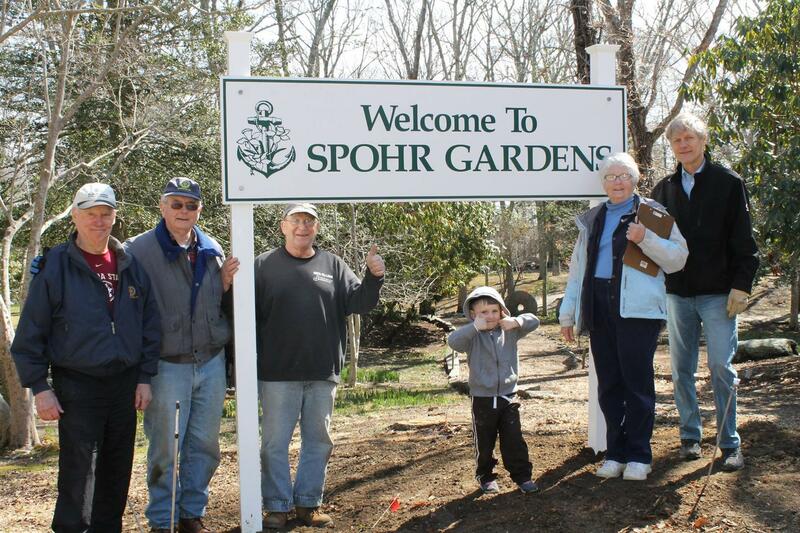 On Saturday, April 11, the Rotary Club, as a community project, assisted Spohr Gardens in redoing the main entrance. A sign “Welcome to Spohr Gardens” now greets you at the entrance. In addition, three waist-high panels explain 1) about Charles and Margaret Spohr, 2) the plantings about the gardens, and 3) the role of the Trustees are explained and highlighted. Foghorn for February 24, 2015 - More of us! Congratulations to the winners of the 2014 Falmouth Rotary Christmas Raffle! Thanks to everyone who participated and we hope you will support this again in the future! We will be updating this list thru January 10th when the final winner is chosen! Falmouth Rotary Invites YOU To Learn About Rotary! The Falmouth Rotary Club is inviting all those in the community interested in what Rotary does to a New Member Reception. 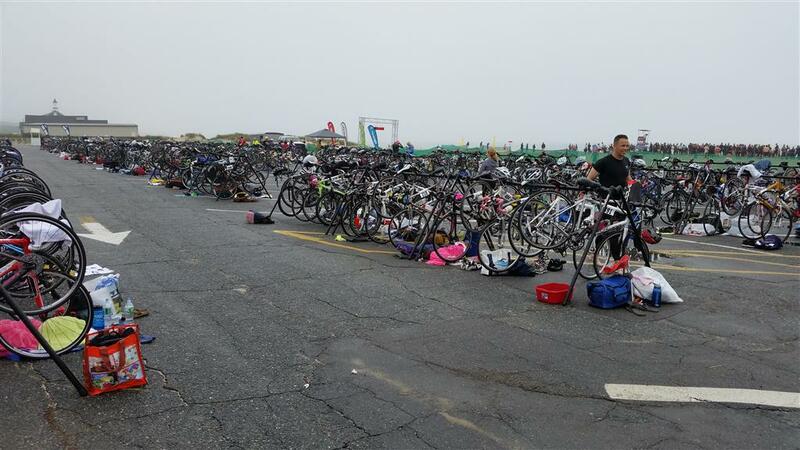 There will be one on October 27, 2014 at Atria Woodbriar and another one on November 6, 2014 at the Sea Crest Beach Hotel. Both events will start at 6pm. We are inviting all those interested as potential members to meet and talk to existing members, learn about various rotary programs, how to become a member and membership responsibilities, and learn about all the amazing endeavors we can accomplish together. These receptions are free of charge and include light refreshments. All interested individuals are encourage to attend. allanwil1999@aol.com or call Tel: 860 - 944 - 8293. On October 21,2014 the Falmouth Rotary Club and the Falmouth Elementary Schools will welcome the Consul General of Guatemala to Falmouth. Consul General Patricia Loavagnino and Vice Consul Jorge Archila will pay visits to all four of our elementary schools to address the 4th grade classes who have been working this year on a project titled "Hands Across Borders". The students are engaged in a school to school project with"sister" schools in Guatemala. They are exploring the culture, language , and art of the country. Writing skills are being put to use in correspondence between students. The Consul General will also be attending a reception at the Falmouth Chamber of Commerce attended by our Town Manager and Selectmen from 11:30 - 1:00pm . The day will be completed by her attendance at the Rotary Club's dinner that evening where she will be the quest of honor and the evening's speaker. Salute to our heroes! 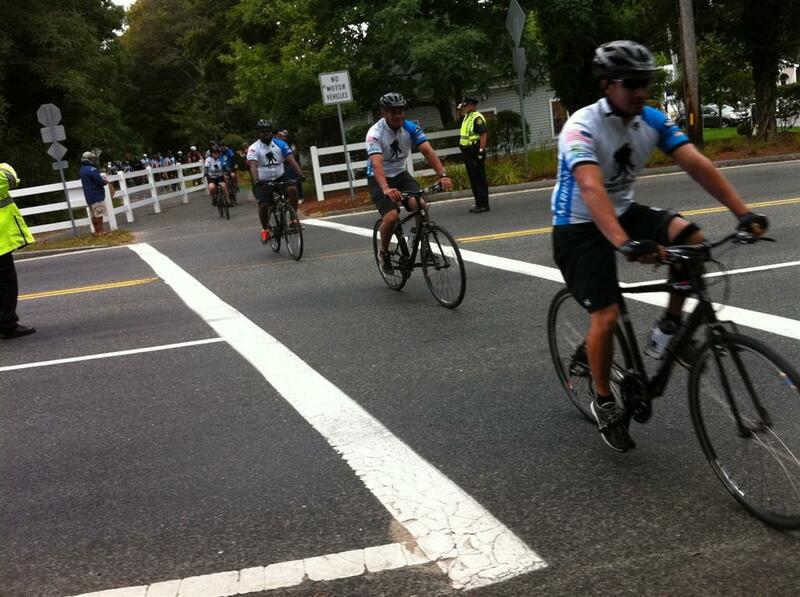 We joined the community in cheering on the Wounded Warrior Project bike ride on the Falmouth leg of their journey today! Thank you to all the brave men and women who give so much! The Falmouth Rotary announces that it will hold its 14th annual Crafts Fair, September 13th and 14th, at the Falmouth Marine Park “Band Shell”. Hours for the fair are 8am- 4pm both Saturday and Sunday. “The Rotary’s Annual Crafts Fair is a family event and has become a tremendous success,” said Rotary President Rich Edes. The fair attracts over 2,500 people, over the 2 day events, who shop at over 60 vendor booths. The event will feature a judged “Old-Time Fiddle Contest” with over a dozen fiddlers competing. This year Falmouth Rotary has expanded their entertainment schedule to include a Fishing Derby for Kids, a USA Kung Fu Demo, Frank O’Rourke, a local musician, dance demonstrations by Cape Cod Dance Center and the Falmouth Dance Academy, and a Mother Goose on the Loose session with the popular Ms. Amy! “We expect that this musical highlight will add additional sparkle to an already lively fair. Last year’s Fiddle Contest and other entertainment was a tremendous success and was well attended,” said Edes. “The Craft Fair, in its 14th year, is now a tradition and is one of the most visible ways Falmouth Rotarians support their community,” said Edes. 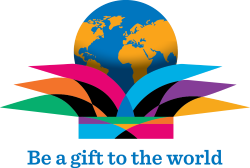 Proceeds from the Craft Fair help Rotary fund its’ scholarships for Falmouth students, efforts to support clean waters and Rotary’s worldwide effort to eradicate polio. 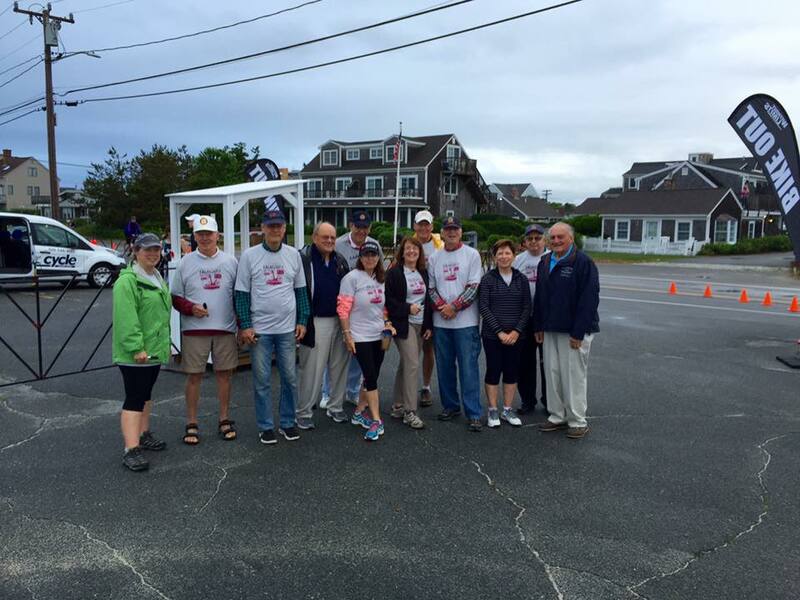 “Founded in 1927, Falmouth Rotary is very active in our community in both large and small ways,” said Edes. Besides, through our scholarships the Falmouth Rotary has helped the East Falmouth Elementary School expand its math and sciences book collection, helped expand parking at Spohr Gardens, has donated funds to VIPS(Volunteers in Public Schools), funded the sign at the Gus Canty center and the kiosk at the Town Hall. “Falmouth Rotary efforts even made the helicopter pad at Falmouth Hospital a reality,” said Edes. Entry is just $2.00 and offers an affordable day of fun for the entire family, he added. Cory A. Rivera, son of Mr. & Mrs. Allen Rivera of East Falmouth is the recipient of the Falmouth Rotary Club's Junior Year Scholarship. Cory is entering his third year of studies at Sacred Heart University. A nursing major, he has been active in many community service activities such as Habitat for humanity, Relay for Life and as student leader for Mission Matters in Mississippi. In addition to his very active volunteer activates he has maintained an impressive 3.98/4.00 grade point average. It was very difficult to choose among this year's field of highly qualified students. All who applied are very talented and we wish them tremendous success! RI President-elect Gary C.K. Huang chose Light Up Rotary as his theme for 2014-15. Huang was inspired by the teachings of Chinese philosopher Confucius who said: "It is better to light a single candle, than to sit and curse the darkness." After announcing his theme at the opening session of the five-day training meeting, Huang urged club members toLight Up Rotary in the coming year by hosting a Rotary Day in their community and including local Rotaract and Interact members in their service projects. 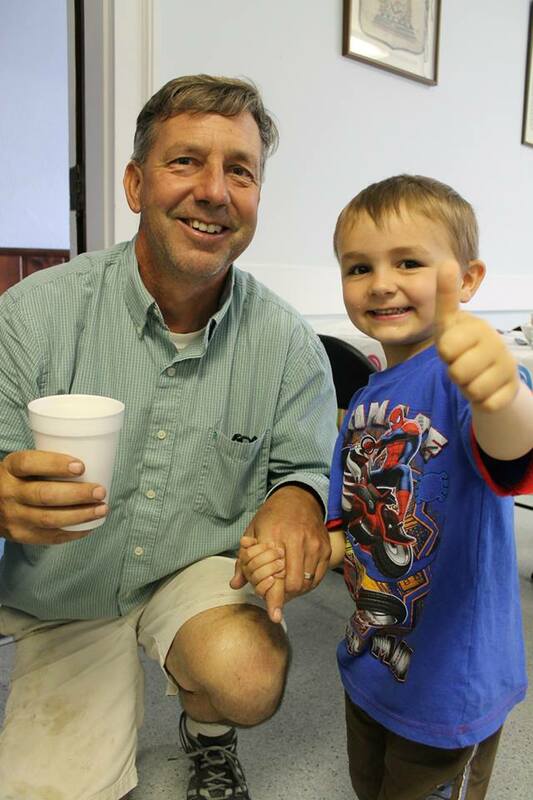 Falmouth Rotary - Pancakes For A Cause A Success! Thanks to all the Rotarians, Masons, Friends and Neighbors for coming out and supporting us in our efforts to raise money to benefit our local scholarships we give out each year! We got the pancake seal of approval from the kids! Check out more pictures from the event in our photo album! Thanks to all our Craigville Triathalon Volunteers! 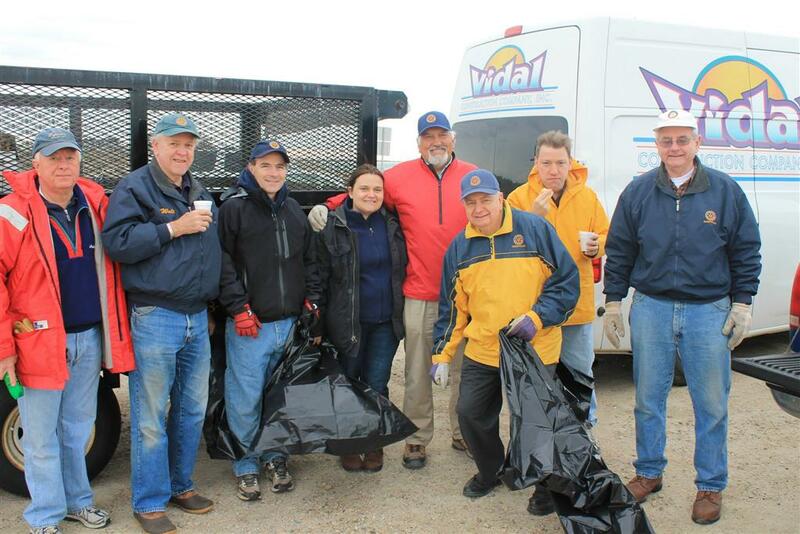 Thanks to all the Rotarians who showed up on Saturday at Craigville to volunteer at the Craigville Triathalon! 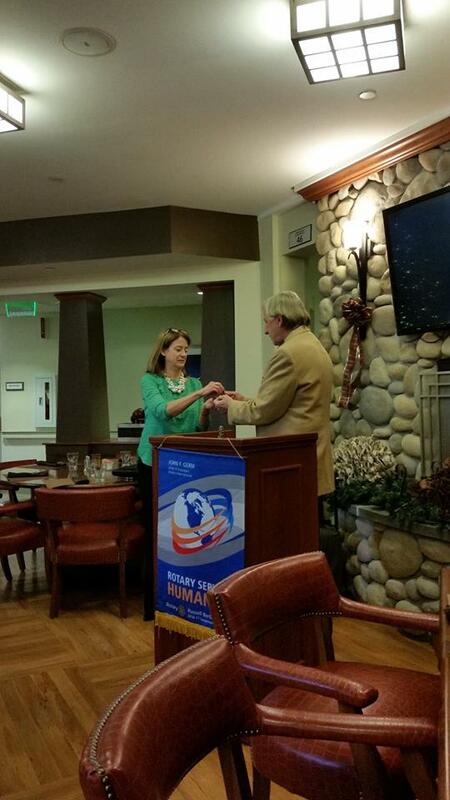 Join us in welcoming new Member and Rotarian: Angela Ackerman! The 2014 College Scholarship Application is now available under the download section of our website! Applications are due by June 1, 2014. Rotary Club of Falmouth was happy to recognize the Student Council Board of Falmouth Academy's class of 2014! The Rotary Club of Falmouth was happy to recognize the Student Council Board of Falmouth Academy's class of 2014! The students were honored with a YMAW certificate and a gift certificate to Eight Cousins Books. 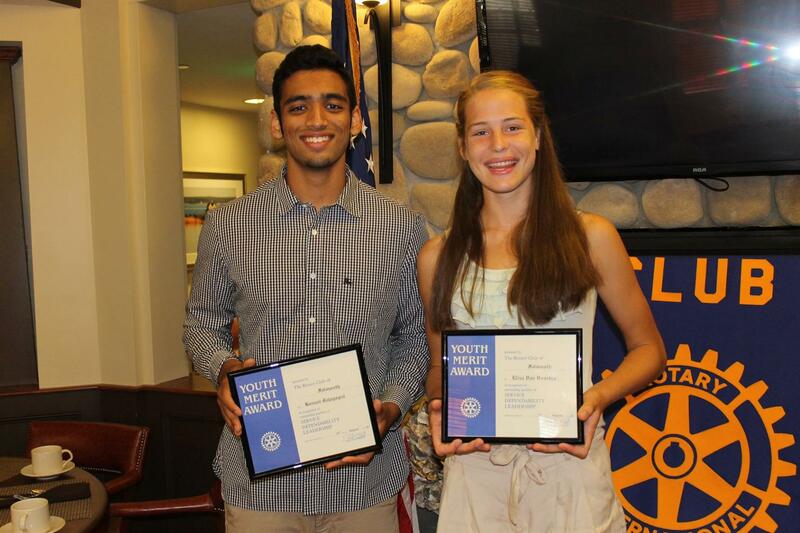 Congratulations to Lilly Patterson, Luke Johns, Mary Rosbach on their accomplishments. Also pictured below are Will Potter and Mike Earley. 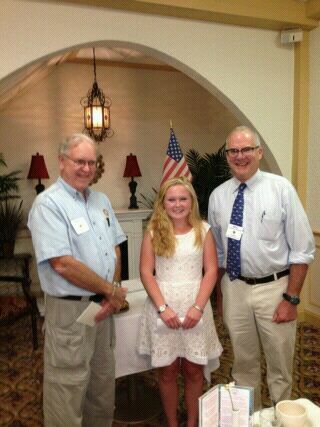 Falmouth Rotary Announces 2013 Junior Year Scholarship Winner! The Scholarship Committee of the Rotary Club of Falmouth is pleased to announce the name of the 2013 Junior Year Scholarship recipient, Meghan K. Anderson. Meghan is a junior at the University of MA-Amherst, majoring in Early Childhood Education and Psychology. The scholarship is in the amount of $5,000.00 paid in two installments. $2500.00 will be presented on July 31, 2013 at the club meeting. The balance of the award will be granted at the beginning of her senior year. Meghan is the daughter of Mr. & Mrs. Edward Andersen of E. Falmouth. She graduated from Falmouth High School in June of 2011. Hats off to Rudy Hunter and the entire Craft Fair committee for another great event Your hard work really paid off for the club and for everyone that attended. Be sure to check out the entire photo album and the Facebook page for more pictures. Welcome new member, Amy Dellaposta! 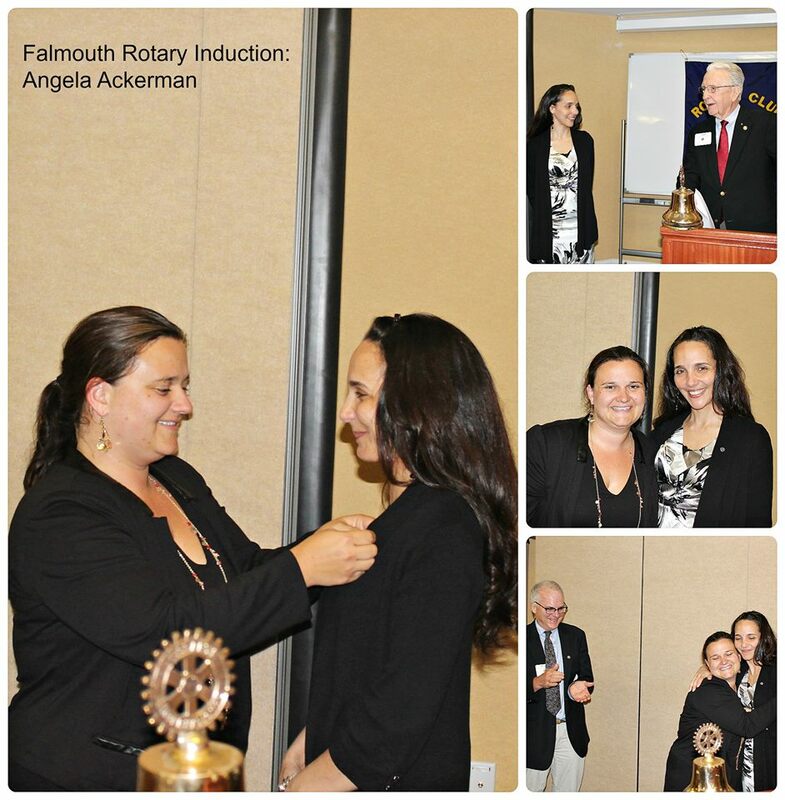 Falmouth Rotary welcomes its newest member. Our summer program continued - recognizing another outstanding Falmouth young adult and the recipient of our $1000 scholarship. Congratulations to Ted Price who is entering his senior year at Falmouth High School. Congratulations to this year's scholarship winner, Alexander Cvitan! Installation and Caribbean Night All in One! The 2012 Officer Installation was a night of fun and new commitments. 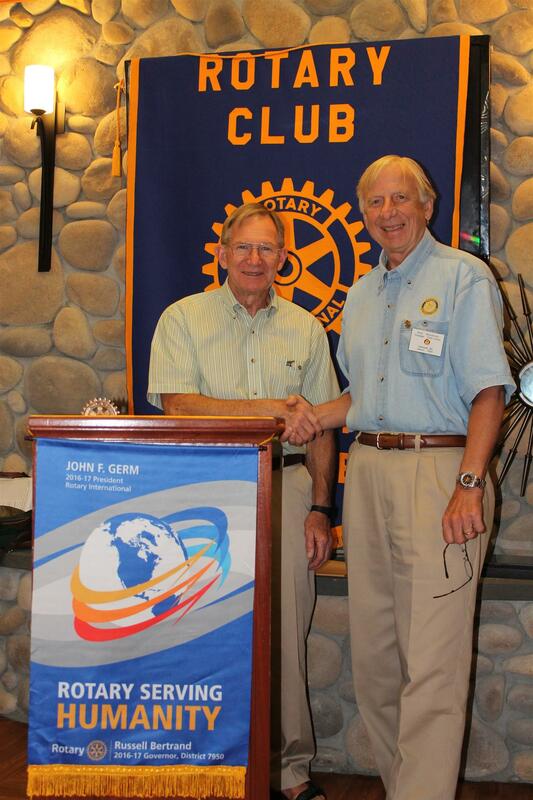 Falmouth Rotary looks forward to the year with President Rob Crocker. Michael Lauf has served since December of 2010 as President and Chief Executive Officer of Cape Cod Healthcare, a regional health system with more than 450 physicians and 4,600 employees. The system is comprised of two-acute care hospitals, the largest home health services agency on the Cape (VNA), a skilled nursing and rehabilitation facility, an assisted living facility and numerous health programs. Mr. Smith goes to Washington? No, Rotarians Visit Boston! Eight Falmouth Rotarians ventured to Boston on April 25 to visit the Massachusetts Statehouse. We were hosted by Representative David Vieira and Kathy Palmer, his legislative aide. What a wonderful and educational journey we had! 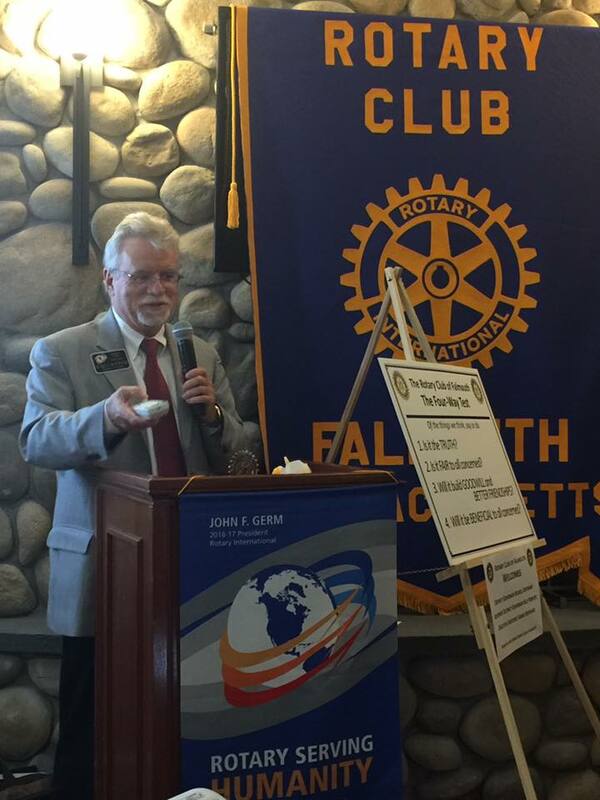 Don Hoffer is well known to Falmouth Rotarians for providing us with informative speakers and topics as well as getting us involved with other community organizations. Now Don is being recognized by the Falmouth Chamber of Commerce for his community contributions by being honored with the chairman's award. RI President Kalyan Banerjee presents Afghan President Hamid Karzai with a medal in recognition of Karzai's support for the Global Polio Eradication Initiative. Thank you for joining us for our fourth annual event that will be held on May 19 at the Falmouth Masonic Lodge on Main Street in downtown Falmouth. Check out the pictures in the photo journals link on the home page for the 2011 event. We were visited by Irene between our last two meetings but we were really blown away by the talent and intelligence of our summer honorees. Thanks once again to Rich E. for his Foghorn words. We introduced the College Scholarship Awardee and met another oustanding Falmouth High School Senior. August 2 - Student of the Week and More! Kat Estes, another accomplished Falmouth High School Student, was recognized as Student of the Week. 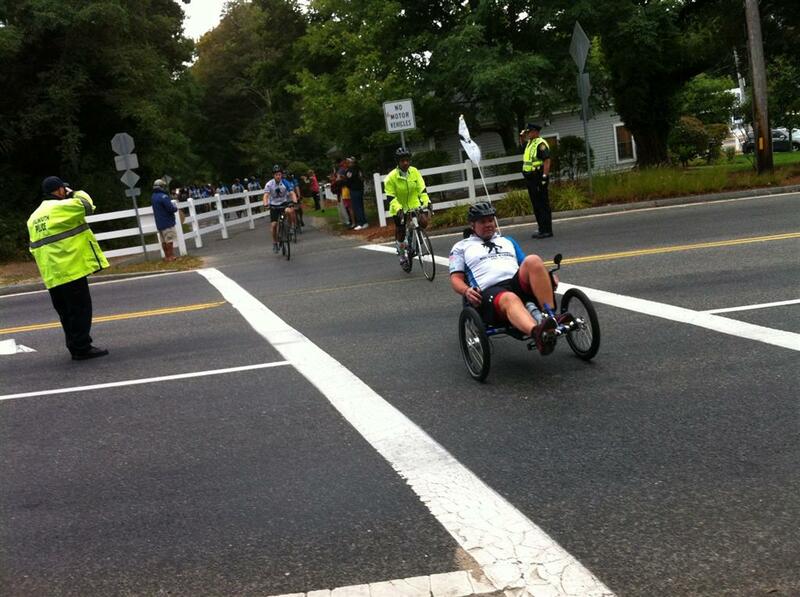 Special guests included Ann Prior of Falmouth Newcomers accompanied by Tommy Leonard of Falmouth Road Race fame. 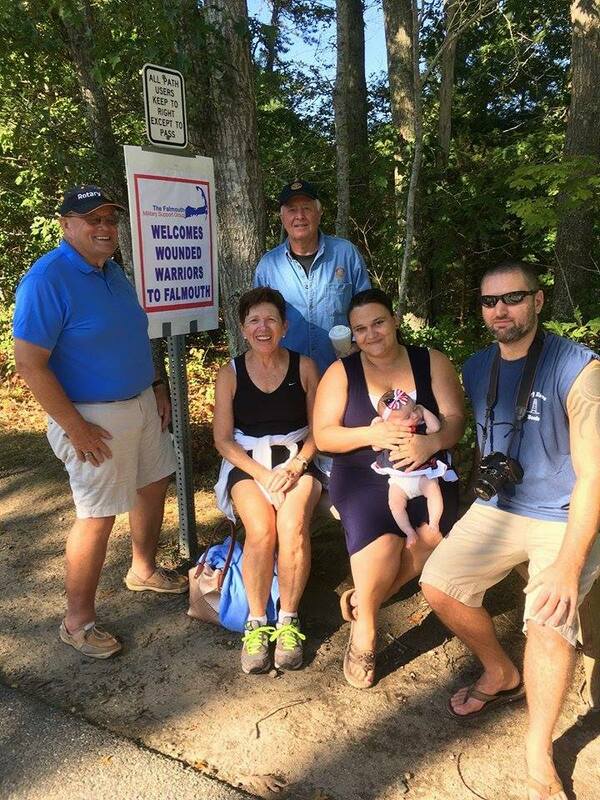 We heard wonderful things about the Falmouth Walk and how funds support non-profits in town. Members Pete P., Bill K, Sari B. and Nick N. expounded on all the great things coming up on the Rotary calendar and service projects taking place at other venues. Read the bulletin and wander through the photo journals to learn more. Congratulations to Maria Urbina and kudos for all your wonderful accomplishments. We continued our annual student recognition by honoring Paige Sellers, senior at Falmouth High School. And a surprise was in store for Past President Jim Lancaster. The club begins a new year with new officers and a time honored tradition of student recognition. Blustery winds and the threat of heavy rain were not enough to keep this stalwart group away from Menahaunt Beach. Click on the link in Photo Journals for more pictures. After 20 years of hard work, Rotary and its partners are on the brink of eradicating this tenacious disease, but a strong push is needed now to root it out once and for all. It is a window of opportunity of historic proportions. Your contribution will help Rotary raise $200 million to match $355 million in challenge grants received from the Bill & Melinda Gates Foundation. The resulting $555 million will directly support immunization campaigns in developing countries, where polio continues to infect and paralyze children, robbing them of their futures and compounding the hardships faced by their families. 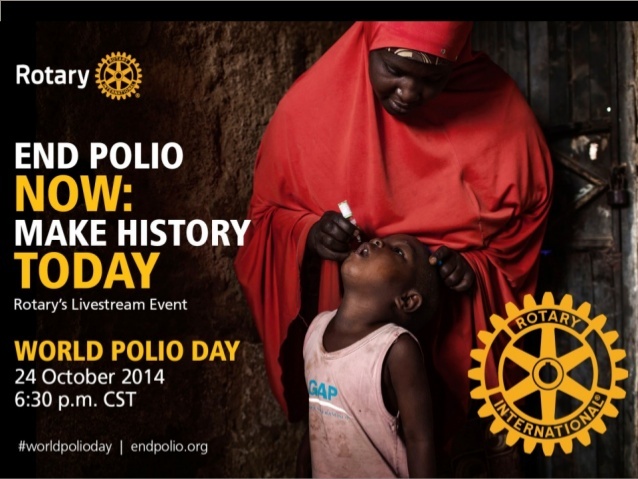 Donate now to help Rotary achieve a polio-free world. Rotary Theme 2011 from Rotary International on Vimeo. The RI Credit Card is one more way that Rotarians can provide benefits for The Rotary Foundation. The student book sale at the Mullen Hall School raised $2,175.50 to buy two Shelter Boxes. The Falmouth Rotary Club has donated $800 to the Spohr Gardens Charitable Trust for the perennial and daffodil rejuvenation projects. The Falmouth Girl Scouts will be continuing their efforts on replanting the original types of daffodils. Last year's planting was an outstanding success and will be enlarged in area. 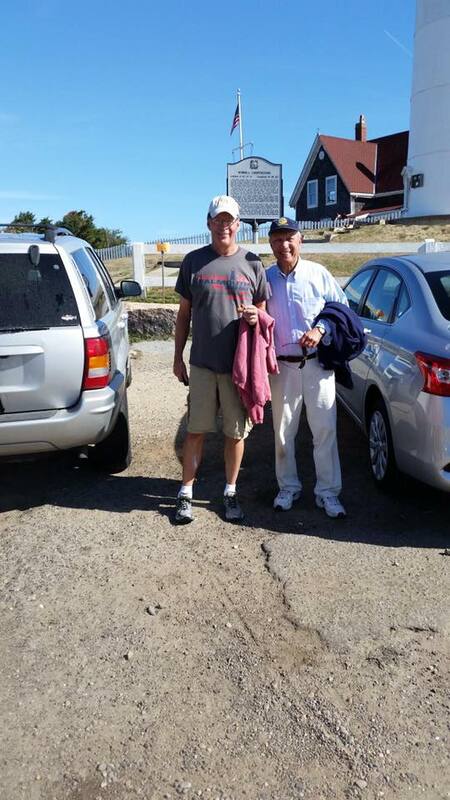 Just seven days after an idea was hatched on a napkin, the Falmouth Rotary Club (and friends! )pulled of a highly successful fundraiser to aid families in earthquake ravaged Haiti. The Falmouth Rotary Club painted two rooms at Community Connections in Mashpee. This is the way to start 2010! 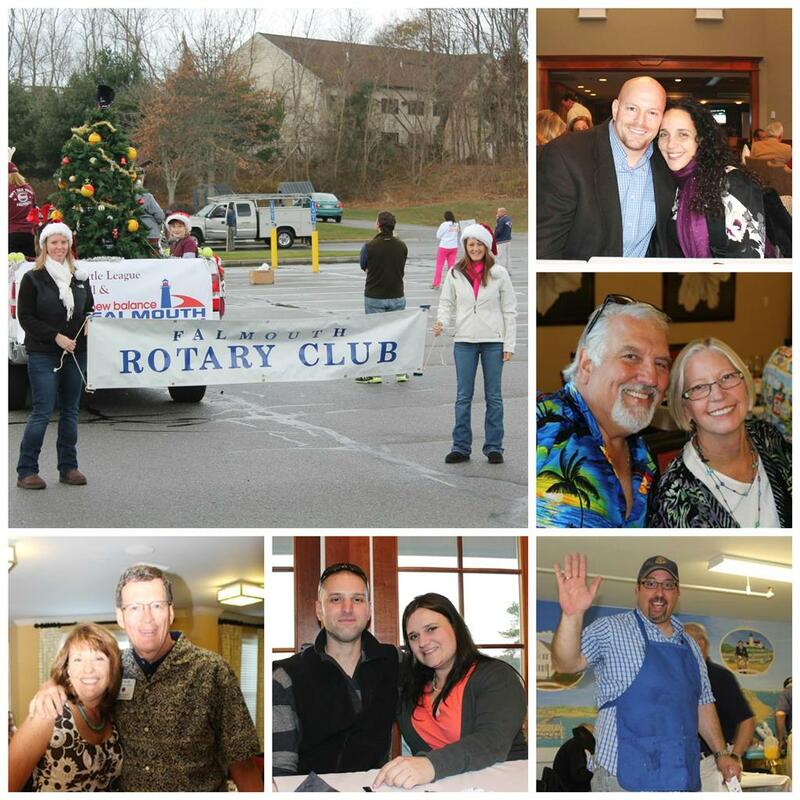 The annual Falmouth Rotary Club Christmas Party was held on December 22. The annual Rotary Polar Plunge was held New Years Day under partly sunny skies with a balmy 35 degree air temperature. 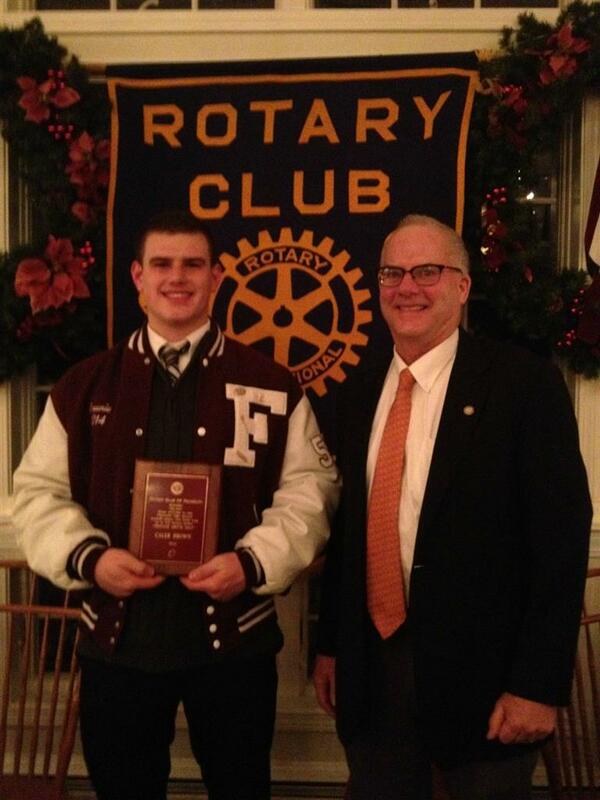 The Falmouth Rotary Club co-sponsored the Falmouth High School's football team banquet for the 91st consecutive year. Chet Fulone and Jim Lancaster presented the Nominating Committee's slate of officers for 2010-2011. 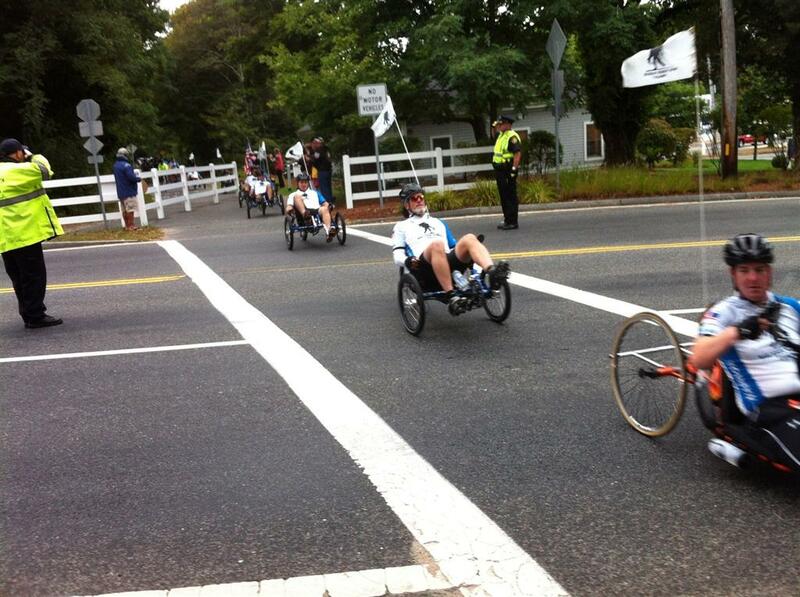 Falmouth Rotarians under the leadership of Don Hoffer volunteered at the finish line of the Cape Cod Marathon. 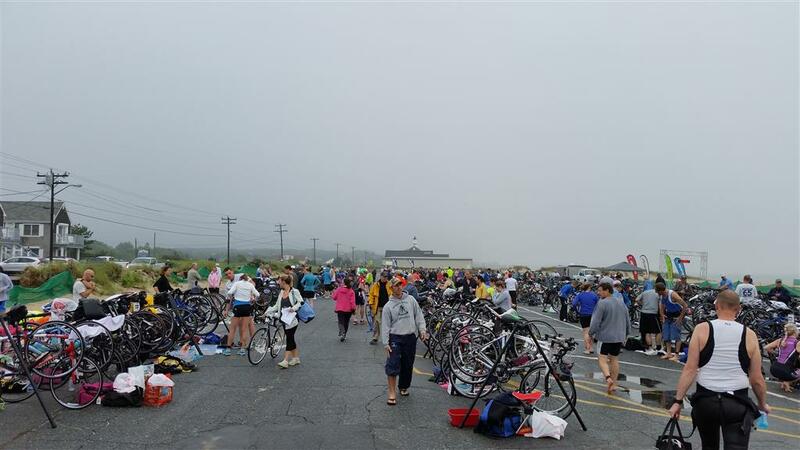 Rotarian Andy Cowling is associated with Community Connections in Mashpee and he has proposed a Rotary work project. Peter Senior, a Rotarian from the UK, sent a nice thank you note to our club for the warm greeting that he received here. 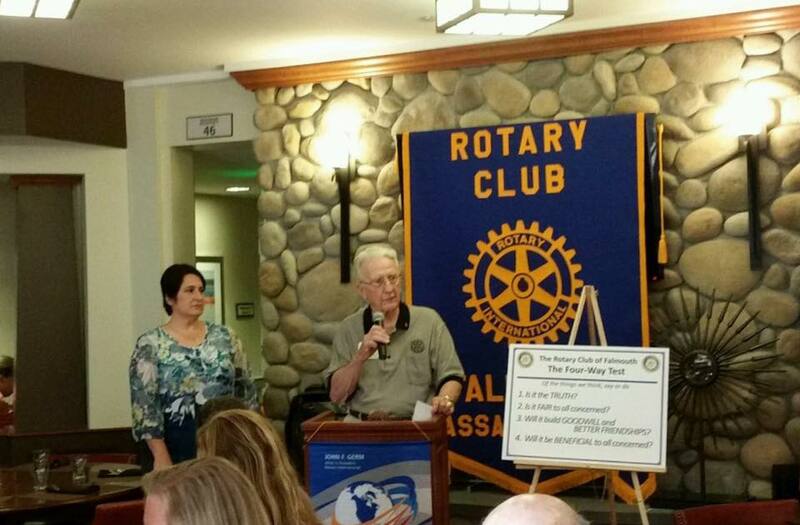 Membership Chair Jack Rosebaum organized the effort to get Rotary on local TV. The Falmouth Rotary Club's new website was introduced to members at the club's weekly meeting on October 13.